Brattleboro Police say drug addiction is becoming a contributing factor to the increased number of robberies in the area. 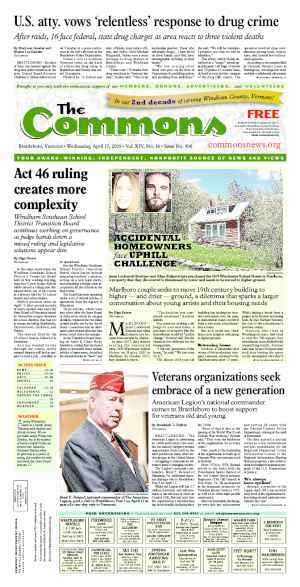 BRATTLEBORO—Three high-profile robberies in the final week of June set the local social media sphere atwitter. But members of law enforcement say that the overall rates of bank robberies and commercial theft remain consistent in town. What is on the rise, say police, is drug use as a motivating factor behind the crimes, and they observe that law enforcement and the court systems are changing to meet the trend. Court documents obtained by The Commons show that drugs played a role in the June robberies allegedly committed by suspects Jared R. Fahmy and Christina Kelley. 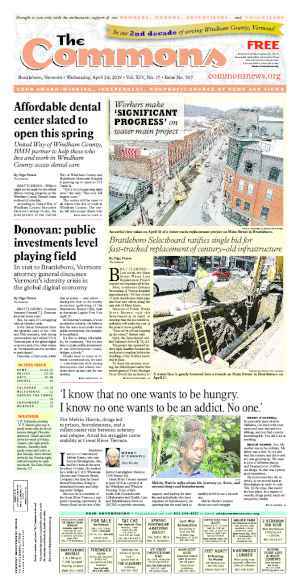 Addictions are debilitating and destroy people’s lives, said Brattleboro Police Capt. Mark Carignan. All three robberies had a link to opioids, said Carignan, calling the drugs the largest motivator of property crimes in Brattleboro. He said that, according to court affidavits, Fahmy recently left a drug treatment program before robbing People’s United Bank at 100 Main St. on June 29. Carignan said he didn’t know what Fahmy did in the four days between leaving the program and allegedly robbing the bank, but he imagined that they were four days spent in desperation. Kelley was staying at American’s Best Inn on Putney Road, Carignan said, and added that she needed money for drugs. On Friday, she walked two doors down and she robbed a McDonald’s restaurant, he said. On Monday, she needed more money for drugs and walked a few more doors down to Dunkin’ Donuts, he continued. According to Carignan, law enforcement has evolved to take a more empathetic stance towards non-violent crimes motivated by substance abuse. Courts, too, have instituted more avenues to help those with addictions, like court diversion programs or reducing charges related to non-violent drug-related crimes, he said. Carignan added that the earlier a person receives addiction treatment, the better the chances of recovery. One strategy toward that end: short-circuiting the court process in favor of rehabilitation programs. The behaviors driven by addiction vary, he said. While the three robberies did not involve the use of weapons, committing robbery “definitely takes it to a different level,” he said. Robberies carry a bigger impact for the community because they happen face-to-face, said Carignan, who said the Police Department investigated the recent robberies aggressively, assigning three detectives to the cases full time. “With robberies, there’s an inherent potential for violence,” he added. People with addictions tend to follow a pattern leading to the court system, Carignan said. First, they become addicted, he said. Then, when they can’t pay for their drugs any longer, they steal from themselves. They drain their savings, or they sell their belongings. Next, many steal from friends or family, he said. And when that source of cash runs dry, most will move to robbing from society — breaking into cars or committing low-level theft. Deep desperation will lead some to high-profile crimes, such as bank robberies. Drugs motivate many people’s behaviors, but not everyone with a drug addiction chooses to cross the line into crime, Carignan said. Three robberies within a week is unusual for Brattleboro, Carignan said. But overall robbery rates have remained consistent. The community tends to experience five to eight robberies in a year, one to two of them bank robberies. Personal crimes, like stealing items from cars, fluctuates. Those crimes are not always drug-motivated, Carignan added. Many personal crimes start as assaults where the “winner” steals from the “loser” to add insult to injury. Most of Vermont’s focus on drugs has zoomed in on opioid abuse. Governor Peter Shumlin made national headlines when he devoted his entire 2014 State of the State address to opiate addiction in Vermont. 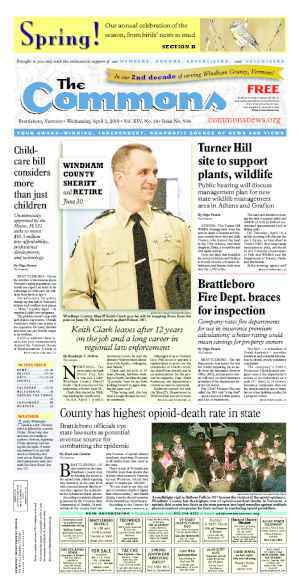 Carignan has served for 13 years in the Brattleboro Police Department and for four years as an officer in New Hampshire. Over his 17 years in law enforcement, he has seen changes in the types of drugs that people use — and that law enforcement investigate. When he first arrived in Brattleboro, “We still paid attention to marijuana.” The hard drug he saw was crack cocaine. Now, heroin — then only occasionally the subject of investigation — has supplanted crack as the drug du jour, he said. Carignan added that many drugs have also become more potent. Heroin, a form of morphine, is more addictive than crack, he said, and most who became addicted to opioids did so through prescription painkillers prescribed by doctors. Society can’t dismiss the issue as belonging only to lower-class segments of society any longer, he added. These gateway prescription drugs have gotten into the middle and upper classes. “There are large numbers and diverse groups who are addicted to opioids,” he said. The courts have become increasingly sensitive to addicts’ challenges, Carignan said. But the court system also needs to balance empathy with punitive measures to deter people’s harmful behaviors. When asked why the legal system has changed its approach to drug-related crimes, Carignan said that law enforcement has learned that treatment has better outcomes than jail cells. Collectively, the courts, law enforcement, and government have recognized that what they were doing wasn’t working, Carignan said. The “War on Drugs” campaigns of the 1980s and 1990s didn’t work, he said. Tougher law enforcement resulted in a big jump in the number of people incarcerated for drug crimes — a policy that, in the short term, made society feel good. In the long term, however, the “war” didn’t resolve the issue, he said. There’s also a greater understanding of how earlier intervention short circuits addiction. In most cases, it has been better than doling out higher legal penalties, he said. It helps when, at the community level, friends and family persuade a loved one to seek treatment, Carignan said. “Unfortunately, a lot of time you need a stick and a carrot,” he said. “Police are a very common gateway for addicts into treatment,” he said. Carignan is seeing a change in how drugs are distributed. Earlier in his career, most harder drugs came to Brattleboro by way of people buying for their friends, he said. Friends pooled their money. A group would then pile into a car, drive to Holyoke, Mass. or Hartford, Conn., and return with enough drugs for their circle of friends. Now, the model has changed. It’s is an organized business with dealers, distribution systems, and markets. Making a tiny circle with his fingers, Carignan said, a bag of heroin contains approximately 31.5 milligrams of the drug, which looks like a pile of dust. A heroin habit is measured in the number of bags a person consumes in a day, he explained. The bags are made of thick, waxy paper often stamped with a maker’s mark, he explained. Drug dealers brand their drugs with images like Mickey Mouse, Carignan said. Users will ask for specific marks, and dealers know who is selling what where. People who become addicted to heroin do so more quickly and deeply than they do with crack, a quality of the drug that ensures increased customer loyalty. “Are you going to sell Timexes or Rolexes?” Carnigan said. Alcohol and marijuana are often pointed to as gateway drugs to heroin, he said. But Carignan finds that drug dealers now start customers on prescription narcotics and transition them to heroin. Some people start an addiction with pills that are legitimately prescribed for pain relief, he said. Oxycodone (sold under the brand name OxyContin) is a semi-synthetic opioid but, like many similar drugs, it becomes less effective over time and people need higher doses, he said. However, the pills are harder to get, Carignan said. Users start to steal pills from family or friends, and in their attempts to get more medication, they see multiple doctors. Eventually, users exhaust these avenues, he said. State and federal governments have also tightened access to these drugs and have raised public awareness of their potential for abuse. OxyContin was also reformulated in 2010 to make it less prone to abuse. Now, as a result, “heroin is frankly easier to get than pills,” Carignan said. A hope Carignan holds onto, he said, is that the community will survive the current opioid epidemic. In the mid-1990s, he worked in Dover, N.H., serving on a drug task force. Crack was a severe problem, but eventually its use dwindled — and the community survived, he said. People with addictions need treatment, he said. The law is more interested in the big drug dealers, who need to be in prison. Vermont passed a drug trafficking law a couple years ago that increased the penalty for people who import drugs into the state, he said. “We need to have a bigger stick for drug dealers,” Carignan said. But, he added, the community should realize their police department will always do what it can to investigate crimes and keep the community safe. Carignan hopes the public understands that if they personally know people with addictions, they should do what they can to get their loved one into a treatment program. “It does work,” he said. 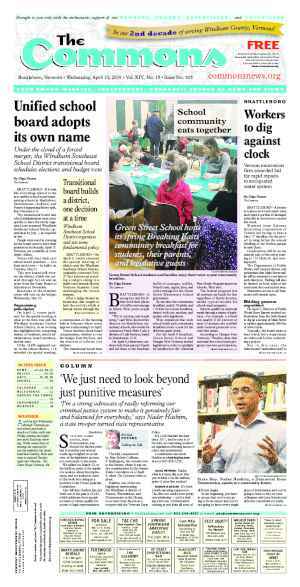 Originally published in The Commons issue #315 (Wednesday, July 22, 2015). This story appeared on page A1.